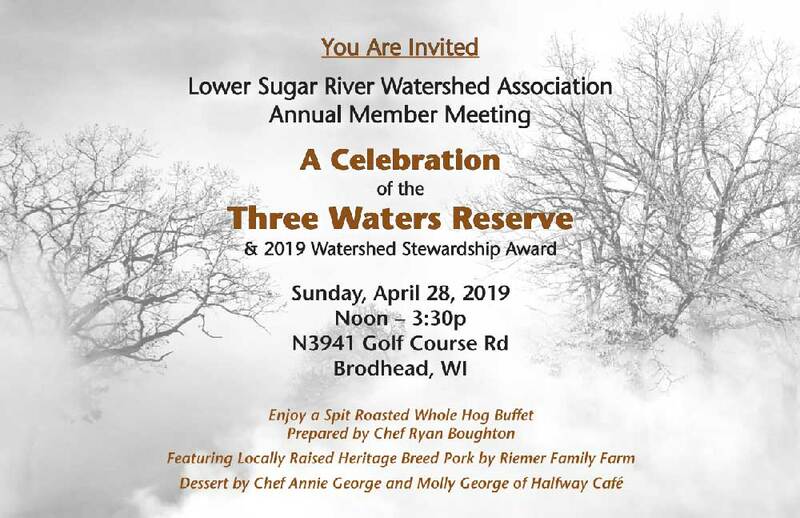 Help us celebrate LSRWA’s new home at the Three Waters Reserve on the Sugar River! — and thank our partner Southern Wisconsin Land Conservancy and other generous donors for making it possible. We will start with refreshments and a genuine hog roast of locally raised heritage breed pork served outdoors buffet style (or indoors, if heavy rain) with seasonal sides and dessert prepared by our talented local chefs and cooks. There will be a charge for the buffet of $10/person, but, if you are a current member or become a member, you dine FREE! To become a member before our event click here. Enjoy a spit-roasted whole hog buffet prepared by chef Ryan Boughton featuring locally raised heritage breed pork by Reimer Family Farm and dessert prepared by chef Annie George and Molly George of Halfway Cafe. Over dessert, LSRWA will hold its annual meeting. We will get to know and elect our Board of Directors and announce the 2019 Watershed Stewardship Award. We will also acknowledge the important work of volunteers and partners in making our watershed a great place to live. And, share upcoming events and activities you’ll want to put on your calendar. Following the meeting, SWLC and partners will provide tours of the property and facilities, and talk about the restoration of the land and refurbishing of the buildings, and educational programming that are underway.